Turkish Angora rescue organizations may help you to help - if you love the breed, why not consider giving a home to a rescued Angora? One would never believe anyone would abandon their Turkish Angora, let alone that you would find one in a cat shelter, but life is not all roses and sunshine. A cat may need rescuing for many reasons - its owner may die, it may run away, there may be allergies in the family... And then of course there are those very sad cases where a cat is mistreated badly. If you wish to give a home to a rescued Turkish Angora, here you will find the websites to those everyday angels who wish to take care of these beautiful creatures in need of a new Forever Home. Do You Run a Turkish Angora Rescue? 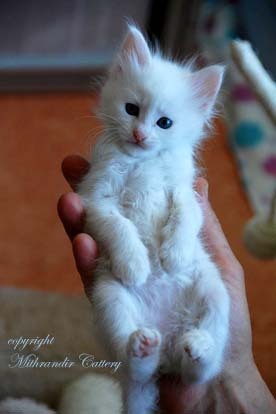 If you have a Turkish Angora rescue organization or shelter, do tell us about it here! Your story will appear on a Web page exactly the way you enter it here (minor editing like spelling mistakes may be done). You can wrap a word in square brackets to make it appear bold. For example [my story] would show as my story on the Web page containing your story.